10 Amazing Flickr Photos of Egypt - Which is your favourite? They say a picture is worth a thousand words….so here is the pictorial equivalent of an encyclopedia, showcasing some of the most stunning images of Egypt which have been shared on Flickr. 10 photos in total, which is your favourite? A great view of a pyramid at sunset. The Pyramids are possibly the most iconic symbol of Egypt, having stood under the burning sun for centuries. Originally built as tombs for revered pharaohs, tourists from all over the world still flock to the ancient sites every year. There are many photos of The Pyramids but this image captures the stark simplicity and instantly recognisable silhouette. A crystal formation in the white desert. Looking like a scene from a sci-fi blockbuster, Crystal Mountain in the White Desert is a place of naturally occurring phenomena, where the remains of a dried up sea bed reveal a plethora of unique features. This photo shows the beauty of the crystals which glitter amongst the sand. Parkour on the streets of Cairo, Egypt. 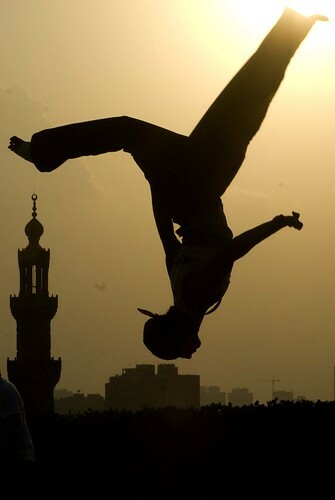 A stunning action photo capturing the art of parkour against the backdrop of Cairo. This high-octane sport involves participants performing a series of breath-taking manoeuvres off walls and obstacles including dives, backflips, cartwheels and handsprings. 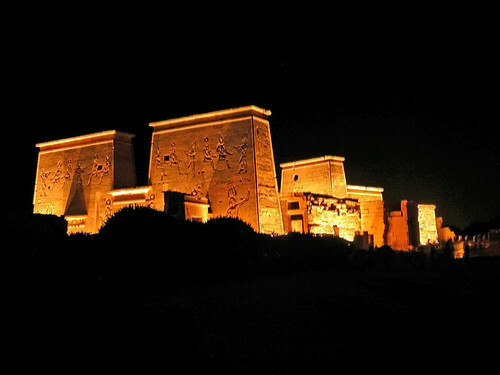 The Philae Temple, Aswan, Egypt. The Temple of Philae lying on an island in the middle of the Nile was originally constructed to pay homage to the goddess Isis. Submerged by the waters, the elegant structure was recovered after the building of a dam, revealing its forgotten beauty and elegance. A picture of the Sanctuary at the Mohammed Ali Mosque, Cairo, Egypt. The many temples and historic sites across Egypt are often ornate, with marble and gilding inside, despite having stood in an arid and dusty climate for hundreds of years. This picture shows the fine detail on the walls, posts and even the pulpit. 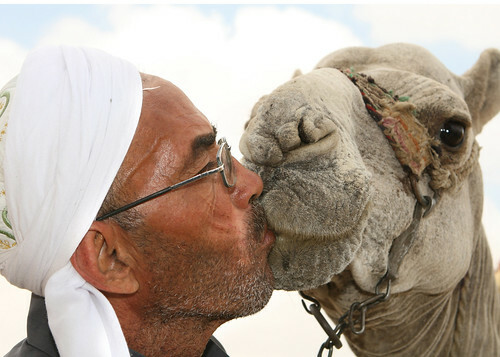 A man kisses a camel in Egypt. Intrinsically linked with the reputation of Egypt, camels are renowned for being grumpy, unhelpful with a tendency to spit at anything and everything. But in actual fact, camels are gentle animals capable of building a close relationship with their owners, although planting a smacker on its lips is perhaps a little unusual! The local Bedouins love the deserts in Egypt. A solo Bedouin woman, robed from head to foot, traipsing across the desert near Hurghada, Egypt depicts the stark reality of life for this tribe. Famous for leading a nomadic and simple lifestyle, Bedouin can traditionally be found in many countries across the Middle East, with many different tribes and honour codes. 8) Don’t forget the Whirling Dervish! The Whirling Dervish is very popular in Egypt. If you peer closely you can just make out the shape of a pair of legs and a person….a perfectly-timed capture of the dance known as the Whirling Dervish performed by Sufi dancers in Egypt. Not just a fascinating form of entertainment, the dance is representative of the Sufi philosophy in life of awareness at all times which they believe is needed to move onto the higher spiritual plane. Diving in the Red Sea offers amazing opportunities to explore the deep. The Red Sea which lies between Egypt and Saudi Arabia is one of the most diverse marine environments in the whole world, providing a rich and extensive coral reef which stretches for more than 1240 miles. The waters are home to many rare fish, 10% of which cannot be found anywhere else in the world. 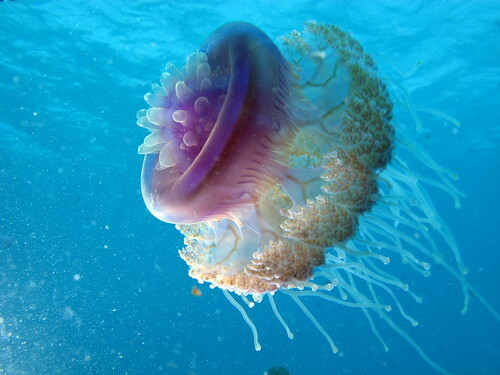 The above photo shows the rare cauliflower jellyfish which may look beautiful but can inflict a nasty sting on exposed human skin. 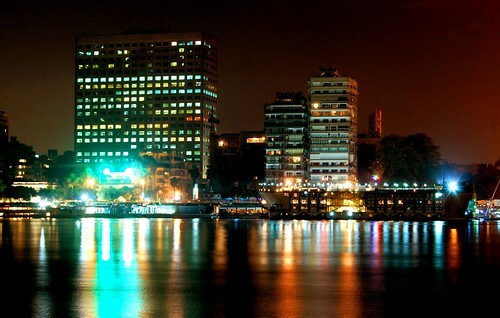 Definitely worth a view, the spectacular night skyline in Cairo. A snapshot of Cairo by night, this photo illustrates the myriad of beautiful colours that light up the city and make it a vibrant place to visit. With its warm climate and surrounding deserts, Cairo can seem like a high-tech island planted into the landscape, bringing the modern world to combine with the ancient sights and sounds of Egypt. The above 10 images represent just a handful of the beautiful, interesting and sometimes downright bizarre images that can be found on Flickr. Why not take the time to browse through some more and discover the wonderful country of contradictions that is modern day Egypt…. Image Credits: Jon Wiltshire, brum d, Nasser Nouri, archer10, archer10, DavidDennisPhotos, JetSetWilly, rytc, Derek Keats, Marwa Morgan. Thanks for the useful information about Egypt and keep it up!